Do you have hummingbirds in your yard right now, in the middle of winter? I do! Perhaps you have wondered, just as I have, how they can possibly survive with our frigid nighttime temps and even some snow. Where are they finding food when all of the nectar rich flowers are dormant? Some people leave their hummingbird feeders up year round, and of course the nectar provided by these feeders do help the hummers who haven’t migrated to survive the winter. 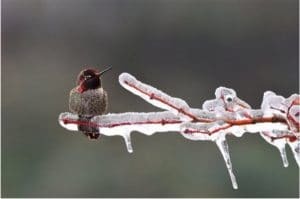 When a winter hummingbird is sighted, the first concern most birders have is why such a tiny bird would take its chances in such an inhospitable environment, and how can it possibly survive. There are several reasons why a hummingbird may be seen during the winter months. First, the bird may be an early or late migrant seeking a spring advantage in claiming territory to attract a mate, or dawdling along on its autumn migration. In either case, an early or late season storm can catch the bird off guard. Younger birds, in particular, may get trapped in winter areas because of their inexperience with migration. Any age hummingbird might fall victim to storms or other factors that push it far off course and into winter’s path. So how do these winter stragglers or early arrivals survive? The first thing they do is to change their diet, subsisting almost exclusively on insects. 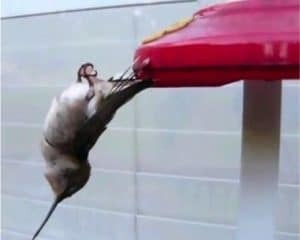 Another amazing ability that hummingbirds have is to go into a state of ‘torpor,’ a type of deep sleep where an animal lowers its metabolic rate by as much as 95%. By doing so, a torpid hummingbird consumes up to 50 times less energy when torpid than when awake. During torpor, a hummingbird’s heart rate can plummet from 1,260 beats per minute to fewer than 50 beats per minute, and its body temperature can drop from 104°F to 65°F! 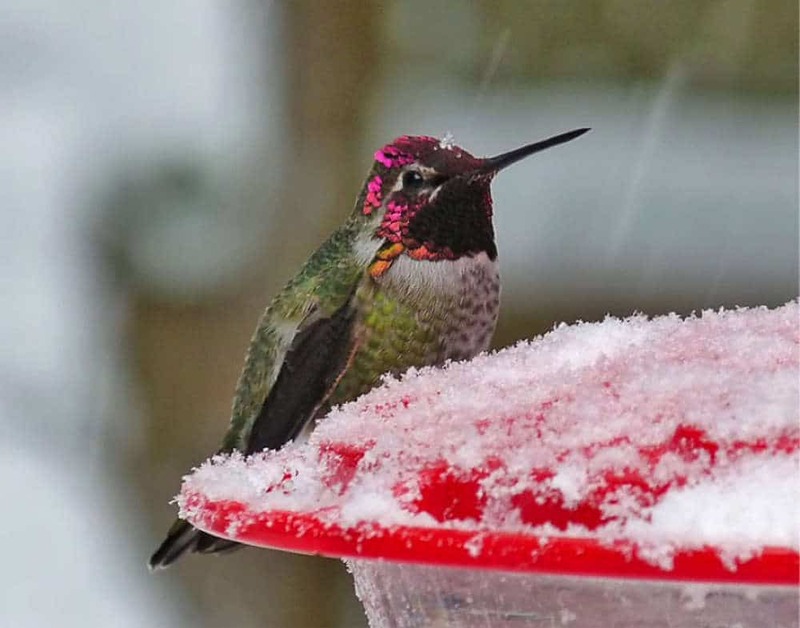 If you continue to feed hummingbirds throughout the winter, here’s a tip to keep the nectar in your feeder from freezing: use one part sugar to 3 parts water, instead of the usual 1 to 4 ratio. This makes the nectar denser and it has a lower freezing point. I hadn’t intended to feed hummers through the winter until one year I saw one zipping from branch to branch looking for food, and I took pity on it. Now, I intentionally leave my feeder up each winter and always have a least one hummingbird visit daily, making winter seem much shorter than I expected!